The expanded CURB-65 score was developed as a simple and more effective severity score for community-acquired pneumonia (CAP) patients. Research authors: Liu J, Xu F, Zhou XJ, Shi LX, Lu RQ, Farcomeni A, Venditti M, Zhao YL, Luo SY, Dong XJ, and Falcone M.
Aim of this study was to develop a new simpler and more effective severity score for community-acquired pneumonia (CAP) patients. A total of 1640 consecutive hospitalized CAP patients in Second Affiliated Hospital of Zhejiang University were included. The effectiveness of different pneumonia severity scores to predict mortality was compared, and the performance of the new score was validated on an external cohort of 1164 patients with pneumonia admitted to a teaching hospital in Italy. Using age ≥65 years, LDH >230 u/L, albumin <3.5 g/dL, platelet count <100×10^9/L, confusion, urea >7 mmol/L, respiratory rate ≥30/min, low blood pressure, we assembled a new severity score named as expanded-CURB-65. The 30-day mortality and length of stay were increased along with increased risk score. 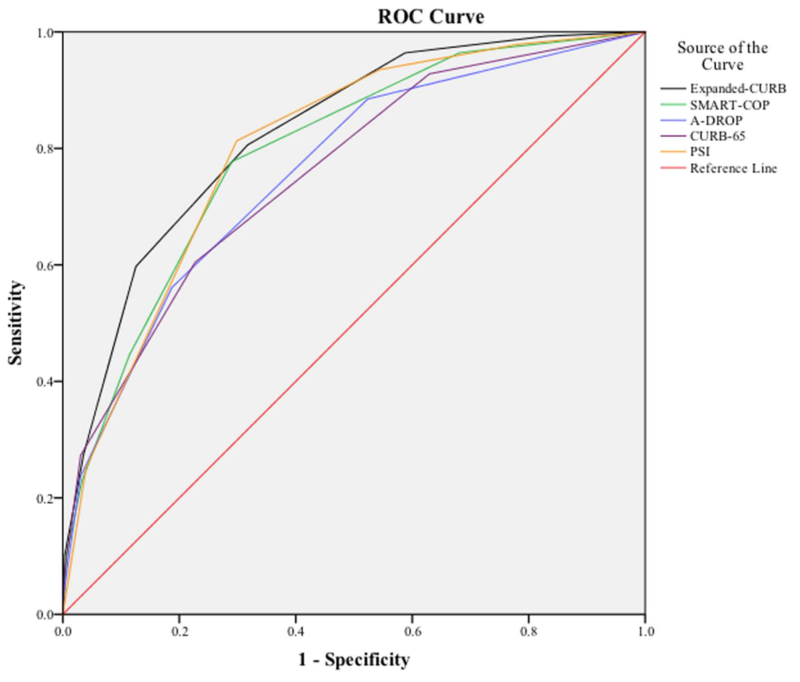 The AUCs in the prediction of 30-day mortality in the main cohort were 0.826 (95% CI, 0.807–0.844), 0.801 (95% CI, 0.781–0.820), 0.756 (95% CI, 0.735–0.777), 0.793 (95% CI, 0.773–0.813) and 0.759 (95% CI, 0.737–0.779) for the expanded-CURB-65, PSI, CURB-65, SMART-COP and A-DROP, respectively. The performance of this bedside score was confirmed in CAP patients of the validation cohort although calibration was not successful in patients with health care-associated pneumonia (HCAP). The expanded CURB-65 is objective, simpler and more accurate scoring system for evaluation of CAP severity, and the predictive efficiency was better than other score systems. Jin-liang Liu, Feng Xu, Hui Zhou, et al. Expanded CURB-65: a new score system predicts severity of community-acquired pneumonia with superior efficiency. Sci Rep. 2016;6: 22911. Original study: Jin-liang Liu, Feng Xu, Hui Zhou, et al. Expanded CURB-65: a new score system predicts severity of community-acquired pneumonia with superior efficiency. Sci Rep. 2016;6: 22911. The expanded CURB-65 is a simple and effective severity score for community-acquired pneumonia (CAP) patients. Liu et al (2016) compared the effectiveness of different pneumonia severity scores to predict mortality. The predictive efficiency of the expanded CURB-65 was deemed better than other score systems. 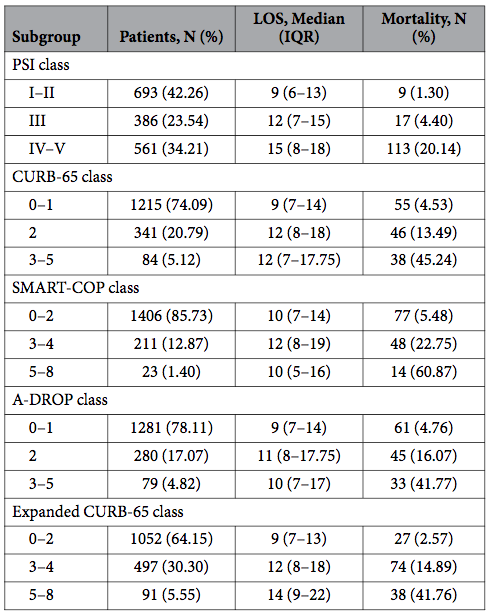 Moreover, the clinical usefullness of the expanded CURB-65 was confirmed in an external validation cohort of 1164 patients with pneumonia. Yet, model calibration was suboptimal in patients with health care- associated pneumonia (HCAP). Validation study authors: Liu JL, Xu F, Zhou H, Wu XJ, Shi LX, Lu RQ, Farcomeni A, Venditti M, Zhao YL, Luo SY, Dong XJ, and Falcone M.